Welcome to issue #5 and Part II of our two-part series on “Making Kin,” inspired by Donna Haraway’s call for an expanded vision of kin and kinship.i For this issue, we again received a record number of extremely strong submissions and as a result, Kristin, Melissa and I had to make a lot of hard choices. I think you’ll agree that every single piece of writing and artwork here is stunning, original beautifully crafted. Some of it is devastating, but all of it is nourishing and necessary. I hope you will take the time to give each one your careful attention. In order to acknowledge the escalating danger and darkness of this time we now offer you Aftermath: 11/9, a column that will appear at the end of each issue. Aftermath will feature dreams, visions, nightmares or communications with nonhuman beings that respond in some way to this era of mounting crimes and obscenities against the earth and her most vulnerable inhabitants--and ideally provide clarity and/or guidance. I very much agree with Greenspan when she writes “our collective dreams carry the truth that is either intentionally or unwittingly obfuscated by the White House and the media.” The dreams in this issue, I believe, do exactly that. A few words about “Making Kin,” a subject which feels more timely than ever. The suburbs of Montreal where I live saw record flooding this past spring. We are not often stricken by natural disasters here–at least not since the ice storm of 1999–so it was remarkable to see the footage of entire neighborhoods under water. Even more remarkable, though, were the continual testimonies of kindness in the papers — often on the part of those who had been hardest hit, e.g. : “This one woman I had never met before just showed up at my door at night and started bailing hundreds of buckets of water out of my basement… Even I found myself helping other people out, and I’m usually selfish as hell.” “Kindness,” of course, has its origin in “kin”–perhaps logically as well as etymologically–and I’ve been noticing, especially on my travels, a sense of kinship that is palpable in a way it was not before the November election. A mere mention of the US president’s name leads to instant bonding with strangers on the metro, with cab drivers, on airport buses. In “Bio-Empathy: Writing to Resee the World” four Toronto writers weigh in about what they feel is demanded of literature in a time of mass extinctions; taken together, the writing and the artwork in this “Making Kin” issue read like a response to the call they have issued. Like Part I, Part II of “Making Kin” is dominated by accounts of intimate relations with our nonhuman kin, relations that in many cases demand or bring about profound changes. 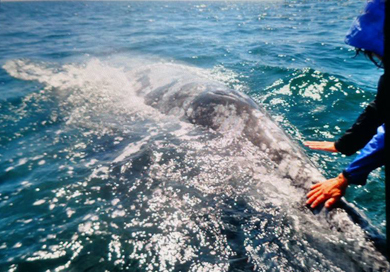 I myself spent a revelatory two weeks in Baja in March being first with the blue whales of the Sea of Cortez and then the gray whales of San Ignacio Bay. The trip was a direct result of the writing in Part I, most especially Nancy Windheart’s “Saved by Whales.” Nancy, who co-led the trip together with wilderness guide Anne Dellenbaughii, persuaded me to sign up. But in truth the persuading had already happened via Nancy’s writing about the whales, which primed me for the experience. Andrea Mathieson’s “Listening for the Long Song” played a role too–in particular her observation that “…most of us have lost our ability to hear the subtle sounds of the Earth and the voices of all her creatures.” I wanted very badly to learn to listen to the whales! I am not yet ready to provide an account of that trip here–though I will try and do so for the next issue. It was difficult, initially. I just couldn’t convince myself the whales would want anything to do with us humans after what we’ve done to them and to the oceans. But after a number of days, it became impossible to deny that they were coming to us and coming for us--and that they were having a powerful effect on me. My rational mind had to no choice but to take a back seat to what was demonstrably happening. In “The Mystery: Approaching the Elephant People,” Deena Metzger writes of a similar process. Over a period of seventeen years, Metzger has made nine trips to see the elephants in Africa. Only now after the ninth trip are certain understandings arising with clarity–and we’re given the benefit of that clarity in this piece. Yet, as she acknowledges, so much still remains shrouded in mystery. What I know is this: I came back from the whales able to listen in ways I couldn’t before. I came back convinced that what I habitually see and hear and feel is a tiny fraction of what I could be seeing and hearing and feeling. “We are all so much more than we think we are,” Moore writes in Great Rising Tide. “We are exhaled by hemlocks, we are water plowed by whales, we are matter born in stars, we are children of deep time.” I came back larger than I’d been before, and I came back smiling–no longer possessed by the madness in Washington. “Now that my eyes opening, I feels like a fool,” Celie says towards the end of The Color Purple. “Next to any little scrub of bush in my yard, Mr._____’s evil sort of shrink.” This line kept repeating itself to me during my last days in Baja. Celie is referring to her abusive husband; I was filling in the blank with–well there were several, and you can probably guess. Can whales make evil shrink? Yes they can! !